Today marks Day #1 of my posting recipes with a cookbook in mind. My favourite kinds of baked goods are those that are easy to prepare, quick to bake, look rustic-beautiful, are made with simple ingredients, and use up items you probably have on hand already. Baking can become an expensive (and indulgent) hobby if you don’t keep some of these things in mind. Look for recipes that require items you already have in your pantry to keep the cost down, and that have limited + simple ingredients to keep your waistline in check. We all love to drown ourselves in a good dose of butter and cream once in a while, but I try to substitute healthier items where I can for everyday baking. There are many substitute suggestions out there these days, but beware- not everything you read on the internet is going to be successful. My two favourite direct 1:1 substitutes in baking are coconut oil instead of butter, and coconut milk instead of milk or cream. These are no fuss, reasonably priced replacements to put your health conscious, dairy-free or vegan mind at rest. All of the recipes I’ve tried that call for a small amount of melted butter (for example: muffins and other quickbreads, etc) have been made with melted coconut oil without any noticeable difference in end product, both texture and flavour. You are not sacrificing anything in swapping out your butter for these types of recipes. Now… shortbread and other cookie batters might be a different story, but start simple and then get creative and experimental with it – see where it takes you. You might even create some recipes yourself! You can use coconut oil in both solid and liquid form. It’s solid at room temperature, and it takes only 20-30 seconds to melt a few tablespoons in the microwave without burning it. There is no strong coconut flavour to it, so don’t worry about all your food becoming coconut-y. PS- When you’re boyfriend says “I brought you home a plum!” you don’t just eat it. You turn it into something even more enticing. 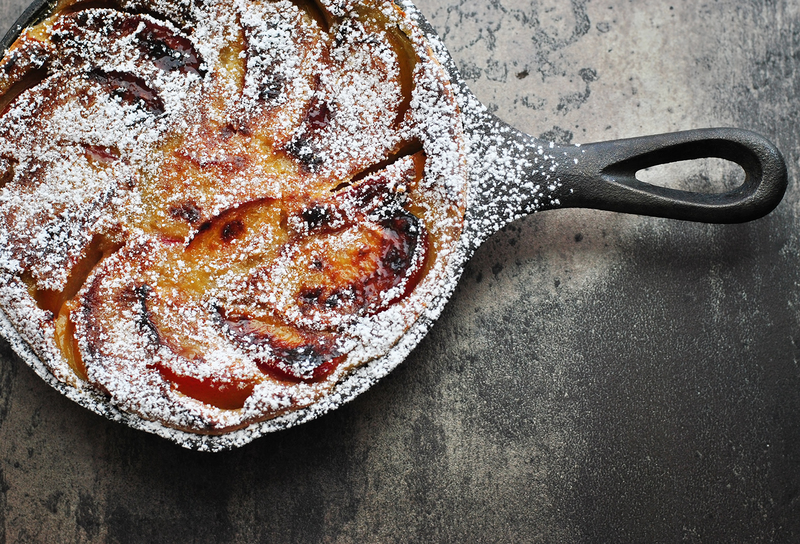 -Begin scaling out your ingredients for the clafoutis while the oven is preheating, and when you’re oven beeps to say it’s preheated: remove the cast iron pan, brush with coconut oil, sprinkle on a light dusting of sugar, and toss is back in the oven while you finish your batter. -Whisk together the brown sugar, salt, cinnamon, vanilla, eggs, and flour in a large bowl. -Cut the plum into small wedges, about 16 pieces per small plum will be the right thickness. This does not need to be precise. You can replace this plum with 3/4 cup of pretty much any diced fruit you have on hand. The classic French version is made with cherries, but you can get creative and use whatever stone fruit or berries you have. -Stir the coconut milk into the dry ingredients with a spatula, being sure to scrape down the bowl, and ensure the mixture is smooth and lump free. 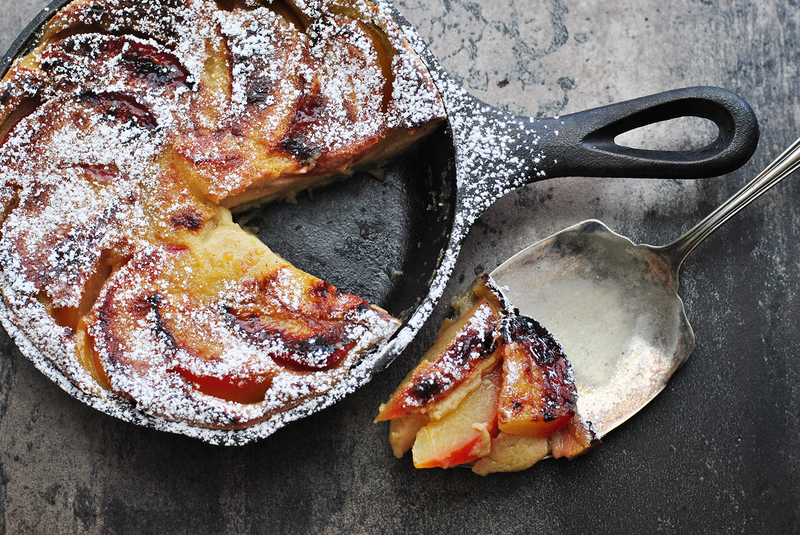 -Grab the cast iron pan out of the oven carefully, pour the batter into it, then drop the slices of plum all the way around. (*Note: I had to remove 1 or 2 TB of the batter from the pan once I placed all the plum slices in, because it was a little too full!) If you fill the pan 3/4 of the way to the top, including the fruit: that’s perfect! The custard won’t volcano up all over the place while baking, but will sink back down a little after it’s pulled from the oven to cool, so keep that in mind when you’re pouring. -Toss the pan into the oven and bake for 30-35 minutes, rotating the pan once or twice during baking to ensure it cooks evenly. -After the first 30 minutes of baking increase the oven temperature to 350 F, and bake for an additional 10-12 minutes. You want to bake custards at a nice low heat for a long period of time for the most even doneness and texture of the baked custard, but I like to crank the heat on this particular item for the last few mins of baking, to add some colour and crispness to the surface for texture. 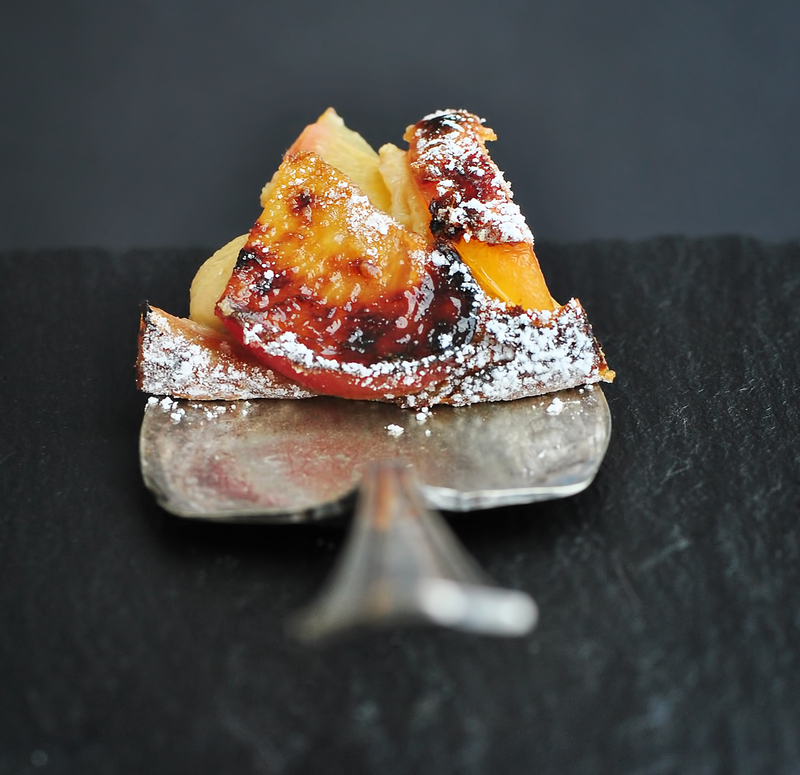 -After baking at 350 F for approx 10 minutes: remove the pan from the oven, adjust the heat to the broil setting, sprinkle the top of the clafoutis with the 1-2 tsp of granulated sugar, and broil for 2-5 minutes to caramelize the top. -The amount of time needing for this last flash of heat will vary depending on your oven. Just stay nearby and watch it until it’s got a nice dark caramelized colour on top. Mine was in for about 5 minutes and got a nice charred look, which I love. Timing and colouring is really up to your preference. -Remove from the oven, cool for 15-20 minutes on a wire rack, dust with icing sugar and serve at room temperature (or slightly warmer). Note* If you do not have a cast iron pan you can make this in any regular ‘ol ceramic, glass, or tin pie dish. Follow the same procedure. Delicious. Really happy with this one. Previous articleFoodSo you want to write a cookbook? : Plans for the Future. Excellent! Let me know how you like it! Thanks Emory! The store looks beautiful! X.
I love your healthy take on this dessert. Beautiful picture and I look forward to making this today. Cheers. Have fun Mary, let me know how it works for you! Is it fine to substitute coconut milk with NORMAL MILK?? Yes Yoonjin! You can use regular milk for sure, that’s the way the recipe was meant to be. I swapped the milk for coconut milk! This sounds delicious, and your pictures are fantastic! Looks like you are on your way! Your recipe looks great and the result even better! Just out of curiosity… how much do you taste the Coconut? Hi Tania! I couldn’t really taste the coconut milk at all here, as the brown sugar, smidge of vanilla extract, and plums overpowered it. You can use ‘light’ coconut milk to avoid flavor or use milk as alternatives!